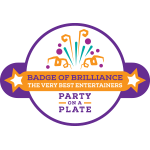 Over 3,500 children's parties to date, and still loving it! Juggling John (aka John Hayns) is an accomplished magic-comedy-circus type performer, never happier than when doing clever, funny, stupid and/or dangerous things with people watching. His recent engagements have included a medieval banquet, an 18th birthday at the (very posh) Benenden Girls School, a group of Norwegian businessmen in an Indian restaurant in Soho amd teaching a group of nuns how to mime... to say he is highly adaptable is an understatement! Apparently John made eveyone sit down at his own 6th birthday party to watch him perform magic tricks! He was taught to juggle at the age of twelve by a friend of the family. He went on to enjoy free entrance to many a May ball when studying for a Masters in Engineering degree at St John's College, Oxford. This was also where John received his grounding in fire eating, street performance and children's entertainment. After university he was a professional children's worker for four years before leaving to take formal mime and physical theatre training at the Desmond Jones School, one of the top three mime schools in the world, where he was a star pupil. 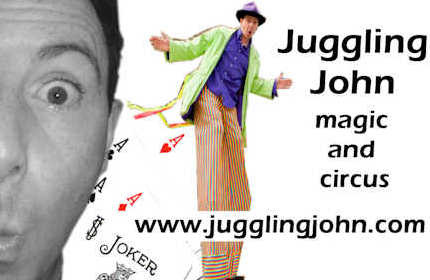 As well as being Juggling John, he does grown-up walkabout magic as magician Johnny Oxford (www.johnnyoxford.co.uk) and runs the entertainment agency Jugglers Etc (www.jugglersetc.com) for children's entertainment and children's parties in and around London and Oxford. Past clients include Universal Pictures, Microsoft, The Conran Family, Jack Dee, Disney Channel, Children's ITV, Carlton Kids, Discover Card, IBM, BMW, Dell Computers, Comic Relief, Cambridge Consultants and Hewlett Packard to name but a few. John is also a professional speaker and writer. You can read his work-life-magic blog here. When not performing or rehearsing, John also works as Deputy CEO for ZANE, a charity helping people in Zimbabwe. He often does work on this in the library of the Oxford Union, where it amuses him to be mistaken for an academic. John's hobbies include playing guitar, reading, cooking and kayaking.